Property is one of the most common investments made by those who wish to increase their money. Whether you have a large amount of savings or have been awarded an inheritance that you wish to invest wisely, the property market is one of the most common and reliable industries for investment. With people always looking for places to live, property investment gives you the options to sell your properties for a profit, rent them to tenants in order to earn a passive income from them, or even rent them out as holiday homes if they are in a prime tourist area. When investing in the property market in the USA, California is one of the best states to consider. Here’s why. If you get a good deal on California mortgage rates, it is one of the best areas to buy and rent out a holiday home. The state of California is one of the most popular for tourism, with visitors from all over the world coming to see popular tourist attractions such as the Golden Gate Bridge in San Francisco, Palm Springs, Yosemite National Park, San Diego, and of course the extremely popular tourist hotspot that is Los Angeles and Hollywood. When investing in property in California, there is a lot of money to be made in reaching out to tourists. Many families visit California, and prefer to stay in houses rather than hotels due to convenience. If you are considering investing in a holiday home to rent, California is one of the best areas to choose. California is home to 38 million people, making it the most populous state in the USA. Because of this, it’s also one of the most profitable states to choose when investing in a rental property. Each year, thousands of people flock to California in search of employment and more, and are in need of somewhere to live. Investing in a property in California opens up a whole range of opportunities for you to make a passive income through contracts with long-term or even short term tenants living in your property. The home to many celebrities and other wealthy people, California has no shortage of people who are willing to pay premium prices to live in premium homes. Student lets are also another option when it comes to rental properties in California – with a range of different universities across the state, there are many students looking for places to live. Last but not least, buying and selling properties is another way to make a profit from a property investment. Many property investors prefer to buy properties that need some work and redevelop them before selling them at a higher price. When it comes to property buying options, there is definitely no shortage in the state of California. Although like many areas, the California property market has had its share of problems, there are still many great investment opportunities for those looking to buy and sell. When investing in property, the state of California and its different cities are definitely wise choices. 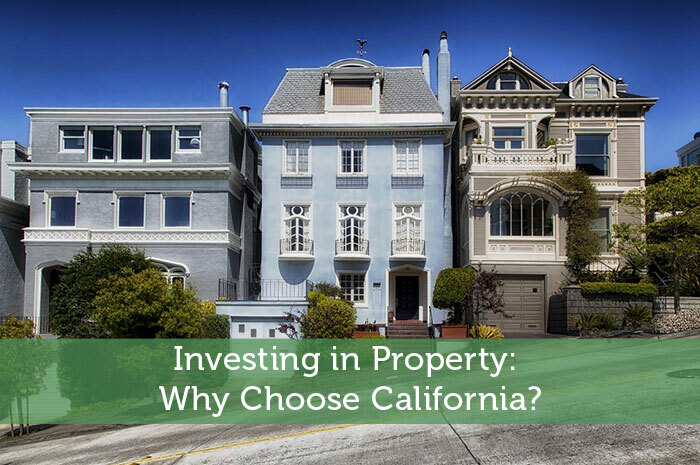 Investing in Property: Why Choose California?